At a height of 2250 M above the sea level, lies a panoramic hamlet known as Chail. Well known for housing the world’s highest polo ground and cricket ground, this beautiful village is also regarded as a heaven for hikers. 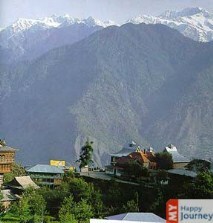 Away from the busy city life, the lush greenery and hilly terrains of the region offer a marvelous view to its visitors. This hill station experiences cool and pleasant climate throughout the year, therefore it is considered as a summer retreat. During winters, snowfall is generally observed which makes the city look more exquisite. The snow covered Himalayan Mountains make the view of this amazing place very eye catching. Built in 1891, the Chail Palace is a proof of the royal heritage of the town. Lush green deodar and pine trees surround it, making it look more beautiful. This palace used to be the summer palace of Maharaja of Patiala, Adhiraj Bhupinder Singh. Another famous attraction remains the Chail Wildlife Sanctuary which houses a large variety of animals. Some of the animals which can be easily spotted here are Indian muntjac, crested porcupine, European red deer and rhesus macaque. This hamlet also has various religious places that are visited by a large number of devotees and tourists alike. The Gurdwara Sahib, which was constructed on Pandhawa hill in the year 1907, attracts innumerable tourists. The architecture of this place is beautifully designed and it is worth a visit. Kali ka Tibba is also a must visit place. Visiting Chail with friends or family is always considered to be a pleasant experience.